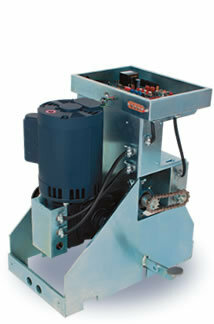 All-O-Matics new SL-150 DC slide gate operator comes equipped with a true integrated long term battery backup. Like all of All-O-Matics DC gate operators the SL-150 DC uses an industry first Brushless DC motor, witch means zero maintenance and high precision. The SL-150 DC comes equipped with a built in loop rack, slow start/stops algorithm, heavy duty frame, emergency mechanical foot pedal release, and is manufactured to last a life time. The SL-150 DC offers up to weeks of uninterrupted operation in the event of a power failure. Unlike other currently available “open and die” single cycle battery backups, in the event of a power failure the SL-150 DC seamlessly switches from AC power to backup mode and runs off of its included (2 – 8Ah) batteries. For heavy slide gate applications there is no tougher more reliable option. All All-O-Matic gate operators are covered by our 5/7 Year Manufacturers Warranty.